Donald Eugene "Don" Nicoll was born in Boston, Massachusetts, on August 4, 1927, and grew up in the West Roxbury section of the city. He is the son of George and Mary Nicoll. He attended Robert Gould Shaw Junior High School and Boston English High School and graduated from Colby College in Waterville, Maine in 1949, majoring in History with a minor in Government. Don met his future wife, Hilda Farnum, also a Colby student, when they worked in the resort town of Ocean Park, Maine, in the summer of 1944. Nicoll began his graduate work at Pennsylvania State College in 1949, where he received a teaching fellowship in the Department of History. His graduate studies concentrated on American history, specifically the period from the Revolutionary War to the Civil War .. His M.A. (1952) thesis was on the Alien and Sedition Acts. Starting in 1951, Nicoll and his family settled in Buckfield, Maine where he picked apples and taught part time at Stephen's High School, located in Rumford. Nicoll began working as an announcer for WLAM radio in Lewiston, Maine. He became a reporter and then news editor for WLAM and WLAM-TV. In June 1954, Nicoll left WLAM to become Executive Secretary of the Democratic State Committee at the request of Frank M. Coffin, who has just become chairman. Mr. Coffin was elected to the U.S. House of Representatives from Maine's Second Congressional District in 1956 and Nicoll went to Washington, DC, as his administrative assistant, continuing in that post until December 1960, the end of Congressman Coffin's second term. Mr. Coffin ran for governor in 1960 and was defeated. After the election Senator Edmund S. Muskie asked Nicoll to join his staff as legislative assistant and news secretary. Nicoll served in that position until 1962, when he became administrative assistant. He continued in that post until 1971, when he became personal advisor to Senator Muskie. He left the senate office in mid-1972. From 1972 until his retirement in 2005 Nicoll worked as a program and policy planner, first as a consultant (1972-73), then as chairman and chief executive officer of the New England Land Grant Universities Joint Operations Committee (1973-1975), then as coordinator of planning and vice president for planning and public affairs for the Maine Medical Center (1975-1986), then as a consultant (1986-2005). His clients were primarily in the non-profit sector and included, universities, libraries, education associations, health care organizations and social service agencies. He also worked as a volunteer, heading a variety of public policy projects, including the Maine Task Force on Government Reorganization, the Maine State Compensation Commission, the Maine (Mental Health) Systems Assessment Commission, the Maine Consortium for Health Professions Education, the Southern Maine Community Television Consortium, the Maine Special Commission on Government Reorganization (co-chair), the Board of Visitors of the University of Southern Maine's Edmund S. Muskie School of Public Service, the Maine-Aomori Sister-State Advisory Council and the Governor's Allagash Wilderness Waterway Working Group. From 1998-2005, Don Nicoll was the Director of the Edmund S. Muskie Oral History Project at Bates College. Interview includes discussions of: environmental legislation; Stewart Udall; Clean Air; Clean Water; formation of the Muskie Archives; Muskie Oral History Project; Public Works Committee during its early days; Allagash Waterway; Intergovernmental Relations; and Muskie’s ability to work with diverse groups. Sirgo, Henry, "Nicoll, Don oral history interview" (1998). 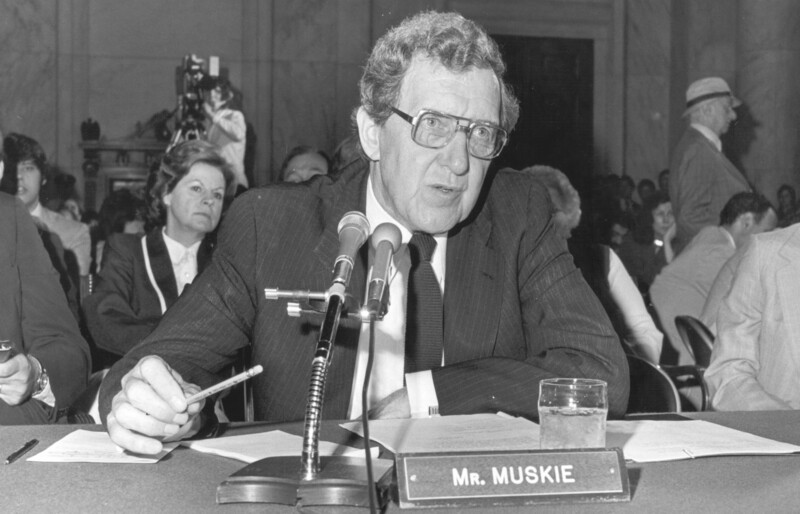 Edmund S. Muskie Oral History Collection. 303.